These 9th grade spelling words are challenging for most adults, including teachers and parents! Your students will gain confidence in their writing when they learn to use and spell words like ubiquitous, idiosyncrasy, rococo and more. Download our Printable 9th Grade Spelling Words. Please note that this is a general list to supplement other curriculum. The needs of your students may vary. 9th grade worksheets for spelling practice: Tricky word search puzzle and word scramble games. Spelling worksheets disguised as word play! Antonym Antics - Challenging vocabulary worksheet for upper grades and adults! 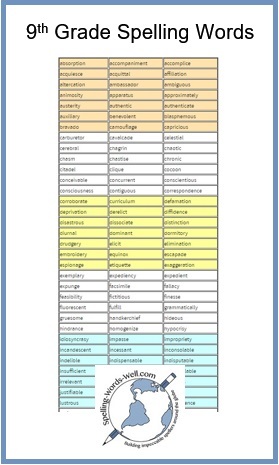 9th grade vocabulary and spelling : A simple idea you can use with the whole class all year long. Students can help you write some great exercises! 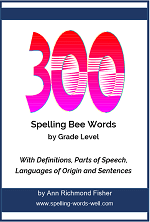 Use our list of 9th grade spelling words for classroom quizzes and competitions, games and worksheets. 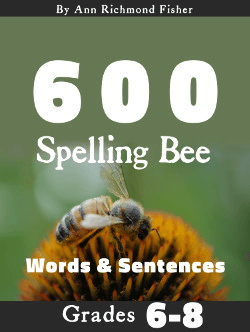 We have free spelling lessons that can help you learn or teach some of these tricky words. 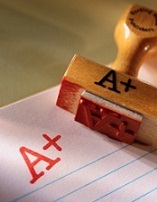 Your 9th graders may also want to brush up on this list of 8th grade spelling words. There are plenty of tough ones on this list, too! For even more practice, try these three tough new word lists!